The early days of Trump’s presidency, and the humiliating rollout of the anti-refugee order in particular, show Trump internalized none of [Obama's advice]. A great deal of reporting backs up the claim that the most ideologically extreme members of the administration cobbled the order together without external input, but the scapegoating is an effective admission that Trump signs whatever is put in front of him, without reading or understanding it. The incentive for ambitious operators within the administration is thus to do whatever’s necessary to get unvetted orders and choices before the president by any possible means, so they become national policy before sensible people can intervene. Heeding Obama’s advice might have helped Trump avoid making an obvious and monumental error, but Trump either lacks the capacity to run the government in an orderly fashion or intentionally discarded Obama’s recommendations, or both. When reality quickly asserted itself, as Obama promised it would, Trump claimed (out of ignorance or malicious dishonesty) that he was merely reprising “ what President Obama did in 2011 when he banned visas for refugees from Iraq for six months”—a “ban” that quite literally never happened. Meanwhile, Trump firing acting Attorney General Sally Yates surprised no one, least of all Yates. And her action, while well within her authority as AG, was at the same time a deliberate finger in President Trump's eye. But the White House statement announcing her departure still managed to break another norm of government and simultaneously diminish both the President and his office another notch. This is only Day 11. In just a few hours, the President will announce his first supreme court nominee with all the pizzazz of a reality show. It'll make him happy, for a moment. And then the nominee will reach the Senate. Should be fun. First, the decision to first block, and then allow, green card holders was meant to create chaos and pull out opposition; they never intended to hold it for too long. It wouldn’t surprise me if the goal is to create “resistance fatigue,” to get Americans to the point where they’re more likely to say “Oh, another protest? Don’t you guys ever stop?” relatively quickly. Combine that with Russia's historical interests in destabilizing the Western alliance and enriching Putin's inner circle plus their obvious influence over the current administration, could this be worse than a coup? Could we be looking at a Russian takeover of the United States? As I said, this could be alarmist. Never confuse malice and incompetence, and all that. But...yikes. Either way, it's bad, and getting rapidly worse. President Trump, very likely, has narcissistic personality disorder. He's almost a textbook case of it, in fact. Remember, also, that Vice President Pence is a dangerous radical. And if you're outside the U.S., remember that most of us voted against these clowns. But hey, there's always Nazi-punching. We will now resume the terror. President Donald Trump is reshuffling the US National Security Council (NSC), downgrading the military chiefs of staff and giving a regular seat to his chief strategist Steve Bannon. Mr Bannon, formerly the head of the populist right-wing, Breitbart News website, will join high-level discussions about national security. The order was signed on Saturday. Under previous administrations, the director and joint chiefs attended all meetings of the NSC's inner circle, the principals' committee. Meanwhile, Republicans who slammed trump just 13 months ago after he said that he was going to do this were remarkably conciliatory when it actually happened. It's almost as if they're opportunistic toadies, who are morally complicit in Trump's attacks on American institutions. So, anti-Semite and power-drunk Steve Bannon scores a twofer, nicely capping the president's first horrific week in office. After seeing ABC's interview of the President, Charlie Pierce hadn't "been this horrified since JFK told us about the Cuban Missile Crisis:"
I wish the biggest problem with the new president* was that he doesn't know what he's talking about, and that what he is talking is insane ragtime from a campaign that, in his mind, never has ended. However, the biggest problem is that, while he's out talking the insane ragtime, truly retrograde policies are zooming into place from people with their own private agendas. The more stringent "gag rule" on abortion that Trump signed into place with his executive order is pure Mike Pence. While Trump is blathering on about crowd size and Peyton Manning, Paul Ryan is as close as he's ever been to his golden dream of dismantling the social programs that, in his mind, stopped serving a useful purpose when they got him through college. The country's environmental programs are being handed over to people who would frack their grandmother's old gray head if they thought there was a buck to be made in doing it. They need a front man who is both unintelligent enough not to get in the way, and enough of a freak show to distract the public from what they're really up to. Luckily, we hit the jackpot for them. Four years of this? It hasn't even been a week. I was going to post about Bruce Schneier's observation that President Trump continuing to use his personal Android phone was a huge security risk simply because it has a microphone that can be triggered remotely. [S]uddenly on Wednesday afternoon, [the State Department’s undersecretary for management, Patrick] Kennedy and three of his top officials resigned unexpectedly, four State Department officials confirmed. Assistant Secretary of State for Administration Joyce Anne Barr, Assistant Secretary of State for Consular Affairs Michele Bond and Ambassador Gentry O. Smith, director of the Office of Foreign Missions, followed him out the door. All are career foreign service officers who have served under both Republican and Democratic administrations. So, we now have a president with no governing experience and the temperament of a four-year-old, a Secretary of State with no governing experience and a worrying relationship with Russia, and no senior leadership at State. And Trump hasn't even been president a full week yet. And just before I clicked "post," the Mexican President cancelled his visit to Washington. This, you see, is punctuation. Because the least-qualified human being ever to be president of the United States still has the enormous power that comes with the office, and he's using it exactly as he said he would. James Fallows has come out of his hiding place (he's writing a book and so has been offline since January 1st) to annotate President Trump's inaugural address. I didn't hear the speech, and now that I've read it, with Fallows' annotations, I'm incrementally more nervous about the next four years. And then came the bald-faced lies about the crowd size at the inauguration. Crowd scientists, such as those at the CIA, estimated perhaps 160,000 people attended the inauguration, somewhat fewer than Obama's record 1.8 million in 2009. The president said he had more like 1.5 million spectators. Press Secretary Sean Spicer had a testy press conference Saturday in which he asserted (at CIA headquarters no less) that Trump had record crowds. For those of us used to the evidence-based world, it made no sense: why would the president's press secretary say something so obviously untrue to the White House press corps? The purpose of the Trump administration’s lies is not necessarily to deceive, but to separate the believers from the disbelievers—for the purpose of rewarding the former and punishing the latter. As chess champion Garry Kasparov, an expert in authoritarianism as an outspoken opponent of Russian President Vladimir Putin, tweeted on Saturday: "Obvious lies serve a purpose for an administration. They watch who challenges them and who loyally repeats them. The people must watch, too." Trump’s self-centered decision process is authoritarianism, and it’s anything but irrational. He campaigned in an authoritarian style, with rallies where he riled up large crowds to jeer at the press and protesters. One of the defining tactics of his campaign was disinformation, coupled with accusations of the same against the media. That hasn’t changed now that Trump is president. The administration’s unified anti-press and anti-fact message over the weekend is part of a deliberate, long-term strategy that was hatched many months ago, and is only likely to intensify. The president will wage a rhetorical war against the media, with the intent of delegitimizing one of the few institutions that can hold him accountable, and he will wage it with his most effective weapon: Lies, damned lies, and false statistics. I've never thought that Trump was crazy or stupid, though I have thought he was unhinged, narcissistic, infantile, immoral, and declassé in the extreme. I've also thought he would try govern very badly. So far I haven't been wrong. On 20 January 2017, the day Donald J. Trump took office as President of the United States, news outlets posted photos purporting to compare the size of the crowd attending Trump's inauguration to that attending Barack Obama's first inaugural ceremony in 2009. 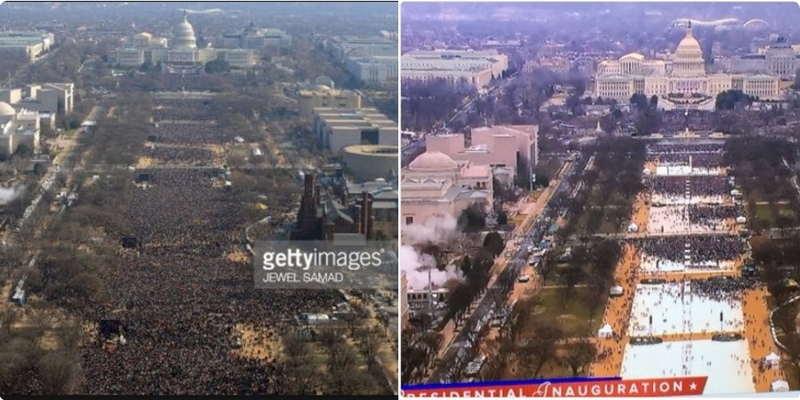 Although there was not yet an official count of how many people actually showed up at the Trump event, so an accurate numerical comparison couldn't be made, the photos did appear to show a significant disparity between the sizes of the crowds, with far fewer in attendance at Trump's inauguration than Obama's. All of which caused a small uproar on Twitter, where some users joked that the National Park Service had "gone rogue," others wondered about the legality of the retweets, and still others defended their content as "factual, not anti-Trump." Later that day, the NPS Twitter account, along with all the other Department of Interior accounts, went silent. While there are vast differences between the Roman Republic and the United States, there are many ways they compare directly. There is always a temptation, in any system of government, for public officials to rule rather than govern; but a well-functioning republic has institutional safeguards to prevent that. Institutions can be corrupted from within, however. And just a few minutes ago, one of the deepest infections in American history just burrowed into the center of our government. We’ve wondered if there is some opponent out there that could force us to unite and work together. Well, that opponent is being inaugurated, not in the form of Trump the man, but in the form of the chaos and incompetence that will likely radiate from him, month after month. For America to thrive, people across government will have to cooperate and build arrangements to quarantine and work around the president. People in the defense, diplomatic and intelligence communities will have to build systems to prevent him from intentionally or unintentionally bumbling into a global crisis. People in his administration and in Congress will have to create systems so his ill-informed verbal spasms don’t derail coherent legislation. Crises of some kind are bound to occur on any president’s watch. They appear especially likely given the crew that’s coming in and their allies in Congress: Given the stated priorities of the people about to take charge, we could very well see collapsing health care, a trade war and a military standoff with China just in the next year. Real crises need real solutions. They can’t be resolved with a killer tweet, or by having your friends in the F.B.I. or the Kremlin feed the media stories that take your problems off the front page. What the situation demands are knowledgeable, levelheaded people in positions of authority. No more than 1,469 days, 23 hours, and 54 minutes remain in this horrible, horrible administration.